We’d love your help. Let us know what’s wrong with this preview of Fudoki by Kij Johnson. For she is a being who started her journ Enter the world of Kagaya-hime, a sometime woman warrior, occasional philosopher, and reluctant confidante to noblemen--who may or may not be a figment of the imagination of an aging empress who is embarking on the last journey of her life, setting aside the trappings of court life and reminiscing on the paths that lead her to death. To ask other readers questions about Fudoki, please sign up. I see this is a sequel, should I read 'The Fox Woman' first or do the novels stand alone? How have so few people read this book? I will have to pimp it all over Goodreads now because Fudoki is simply lovely. This book is two stories rolled into one. In 12th century Japan, Harueme, an elderly princess, sits down to write a story that's just itching to get out: of a cat who's turned into a woman and a warrior and has the adventures Harueme never had. Harueme's memoirs intertwine with the story of the cat, without real boundaries between the two. This might be best described as historica How have so few people read this book? I will have to pimp it all over Goodreads now because Fudoki is simply lovely. This book is two stories rolled into one. In 12th century Japan, Harueme, an elderly princess, sits down to write a story that's just itching to get out: of a cat who's turned into a woman and a warrior and has the adventures Harueme never had. Harueme's memoirs intertwine with the story of the cat, without real boundaries between the two. This might be best described as historical fiction, since the fantasy elements are all in the cat's tale and the cat probably doesn't exist, but there's enough ambiguity that it works well as historical fantasy too. This was an unusual reading experience for me. I initially read the first few pages, decided it wasn't the thing for me at the moment, and set it aside, but then found myself thinking about it. And that's the way this book works. There's nothing flashy or in-your-face about it; it draws you in subtly, plays on your emotions without your realizing it, and you slowly come to realize just how good it is. I'm used to reading books through in a mad rush these days, but this is one that demands you slow down and read a little bit at a time. "Calming" is a good way to describe it. "I knew they could not see me well through the screens, so I learned to slip a small notebook into my sleeve, to have something to read during these visits: if they had nothing useful to say, I saw little reason to attend carefully. I actually read all the way through the Diamond Sutra in this fashion, which I am sure did more for my soul than any remorse they might have hoped to engender." Not flashy, but full of thought and humanity. And it also brings me to my last point, which is the setting. Johnson isn't Japanese, but you might not realize from the text; the book is clearly well-researched but the details stay in the background, subtly fleshing it out as needed. The setting feels three-dimensional, and never exoticized. The mythology is interesting and fits very well into the story; I knew I was hooked from the moment the cat encounters a dead woman's ghost trying to shake her body into wakefulness. Cats are too fierce for gods; they came godless from Korea many tens of years ago, and they worship no one. This is good, for they are free in ways men are not; but this is bad, because they are utterly alone in the world. Fudoki is the story of a cat, told by a princess trapped in her rooms by old age, tradition and ill health. But like any great story, it is much more than the surface detail. It is about freedom and courage, love and friendship, conflict and poetry. Set in 11th Century Japan, at the height of the Heian period that was famous for the rigid formalities of court life, for the rise of the military caste, for the writing of classic monogatari epics, for the rise of Buddhist and Chinese influence on the Japanese culture. All of these historical facts are masterfully captured in the pages of Kij Johnson novel, combined with subtle fantasy elements, also typical of Japanese tales: ghosts, animal spirits, kami deities ( they are everywhere, in everything from a family's shrine to a dying cycad-palm on a beach in distant Satsuma province; and their voices are everywhere, all chattering or twittering or intoning at once ). The term fudoki is used to describe self and soul and home and shrine, all in one to a cat , continuity and tradition and identity through stories. When a feral cat living in an abandoned residence sees her world destroyed in an earthquake and the subsequent firestorm, she loses her fudoki and is cast adrift on an epic journey that will gain her the title Kagaya-hime, the Cat Who Traveled a Thousand Miles. The tale of Kagaya-hime is put down on paper as a journal of the last days in the life of Imperial Princess Harueme. Born under a thousand thousand rules, the princess finds solace and escape from her monotonous, cloistered existence in imagining the adventures of the little tortoiseshell cat. The two stories weave around one another, giving meaning and purpose to each other, princess and cat becoming kindred spirits, sisters-in-arms, dream and reality walking side by side. As Princess Harueme recalls the loves and friendships that made her life endurable, so Kagaya-hime learns to abandon her loneliness, her isolation and to relate to the people, animals, and kami that are part of her story. If you are looking for an action packed, edge of the seat thriller, this book most probably will not qualify. It is a poetic meditation, often infused with sadness, mostly contemplative and passive observation of the world. Both main actors are outsiders: Harueme is often forced to look at the world and converse with people from behind a privacy saving curtain, her every gesture and word subject to rules and interdictions; Kagaye-hime is isolated by her predatory instincts, her orphaned status and her fiercely protected independence. The prose of Kij Johnson is a joy to behold, feelings and moods often reflected in nature's shifting landscapes, in the play of rain and wind and moonlight on formal gardens or majestic vistas. The depth of the research is impressive, detailing the aristocratic dance of the Heian nobility, the frankly very liberal courtship traditions of the period (where the women often had the liberty of inviting a favorite into her private chamber, regardless of marriage status), the cultural and social interactions ( Young men and women together in the moonlight breed poetry as oak trees breed mushrooms . War has a special place in the story. Although the exclusive province of men, women experience it either remotely through the scars left on their brothers and lovers or directly when their house stands in the way of war bands. The research is again exhaustive: the armour, the weapons, the strategies, the economic implications, the extreme cruelty, and the ultimate pointlessness of the exercise, they are all part of the journey of Kagaya-hime. Well, Takase said, his tone measured, as if he were about to comment on an arrangement of irises. We will kill them. They will kill us. But it will be done. Go on, then. : this is one of the most chilling and succint discourses from a general before the battle I have ever read. Religion is another aspect explored in the text, beside court manners and warfare. Harueme grows up in the animist tradition of old Japan: Is not everything filled with kami, every stick and rock and leaf? Perhaps I have been the first to recognize and worship this kami, but that did not mean it had not been there, lonely and hungry for attention, like a bored little girl. Now, so many decades later that I do not choose to count them up, I think there may be another truth to this - that the rock was worthy of worship because it had been worshiped - that every shrine in the world began as mine did, with someone's longing for something greater than herself. Kagaya-hime is herself led and transformed by kami spirits, wild and unpredictable, probably benevolent, just as likely indifferent to her fate. Animals, as higher life forms than rocks and twigs, share both language and social institutions with humans, not so much different here than in the fables of Aesop and La Fontaine. Some references to events and characters from the previous Kij Johnson novel (The Fox Woman) are present here, but the two stories are largely self contained and can be read independently. I picked this book up as it counted for the challenge of reading a book which focuses on a PoC character, and this one follows a Japanese cat-woman, Kagaya-hime, and a Japanese Princess, Harueme. We follow the story of two lives, the first is our Princess, Harueme, who is now in her late seventies and is reminiscing about her life and the things she misses or enjoyed. We get to follow her tale through her notebooks as she writes in her old age to tell her life story. We also follow through Haruem I picked this book up as it counted for the challenge of reading a book which focuses on a PoC character, and this one follows a Japanese cat-woman, Kagaya-hime, and a Japanese Princess, Harueme. We follow the story of two lives, the first is our Princess, Harueme, who is now in her late seventies and is reminiscing about her life and the things she misses or enjoyed. We get to follow her tale through her notebooks as she writes in her old age to tell her life story. We also follow through Harueme's notebooks, the story of Kagaya-hime. A young cat-woman who is lost after the rest of her family are killed in a fire, and so she transforms into a woman and yet retains much of her cat-soul in the transformation. She doesn't really understand the ways of humans, and we follow her as she tries to understand them and learn from them. Overall, this is a solidly interesting story with a lot of reference to the Japanese culture and the influences are told beautifully throughout. I really enjoyed experiencing the life of the princess Harueme and seeing how she was an older character in a fantasy book was really refreshing too. The Japanese elements come largely from folklore of Japan and we see Gods and spirit animals on the stage of the story too. 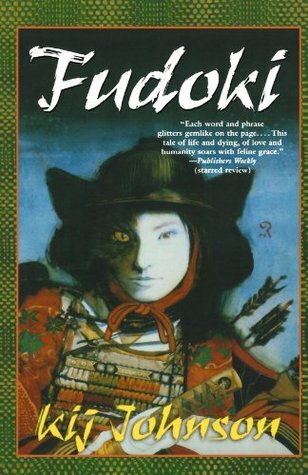 I really found that there was a lot to learn and love about these tales and the Fudoki was something vitally important to the cats of this book. I also think Kij Johnson did a really good job of personifying the cat at times and making her seem realistic but fun and lazy all at once, just as a cat should be! The story of a cat who became a woman, in Heian Japan, around 1129 AD. The novel is related to her first novel, The Fox Woman , set in the same era, and there are a couple of related characters in this book. The novel is also related to “The Cat Who Walked a Thousand Miles”, http://www.tor.com/2009/07/14/the-cat... , which you may want to read first to get a feel for the setting. The cat-woman is presented as a story within a story, "as told by" a contemporary princess who, in story-now, is dyin The story of a cat who became a woman, in Heian Japan, around 1129 AD. The novel is related to her first novel, The Fox Woman , set in the same era, and there are a couple of related characters in this book. The novel is also related to “The Cat Who Walked a Thousand Miles”, http://www.tor.com/2009/07/14/the-cat... , which you may want to read first to get a feel for the setting. The cat-woman is presented as a story within a story, "as told by" a contemporary princess who, in story-now, is dying of cancer, reminiscing about her long life at the Imperial Court, and setting her affairs in order. This device works pretty well, but gets confusing about halfway in, when the Princess seems to become unmoored in time. The cat-woman becomes involved in a small provincial war, no less nasty for being small. The author has done her homework, and the level of historic detail in the book is remarkable. But I could have done without the graphic scenes of villagers being burnt out of their homes, and shot if they tried to escape the flames. A blank notebook demands words. Which words? I wonder. Princess Harueme is nearing the end of her life. The pain and heaviness in her chest is undeniable. She is saying farewell to her friends and servants, preparing to leave her great-grandnephew the Emperor's court and become a nun for the brief time she has remaining. This is during the Daiji era (1129 C.E. ), not very long after cats first came to the Eight Islands of what we now call Japan. Among her accumulated trunks and boxes, Harueme finds a number of beautiful blank notebooks, each demanding words... and so she grinds some good black ink, picks up her favorite wolf's-fur brush, and begins to write the tale which becomes Kij Johnson's 2003 novel Fudoki. No, "fudoki" is not some new number-puzzle game. Google Translate tells me, without apparent irony, that its English translation is "feng shui"—which I'm willing to believe is technically accurate, but the way Kij Johnson uses it here, the word means something more like "oral genealogy"—the proper arrangement of matrilineal biographies, stretching back for generations of lives. The tortoiseshell's fudoki was many cats long, and she knew them all—The Cat with a Litter of Ten, The Cat Born the Year the Star Fell, the Fire-Tailed Cat. Fudoki feels its way slowly and carefully, building up its utterly convincing milieu from many small, perfectly-placed details. Its fantasy elements become apparent only slowly—the first few chapters are straight historical fiction, however exotic the setting. Most monogatari tales are about what their authors already know: life as a court noblewoman, the mannered round of exchanged poems and misunderstood intentions. I am intimately familiar with this world: I was born for it, and have lived at court for fifty years. And here, where I tell the tale of the cat who became a woman, I confess frankly that much of my life bored me senseless. What man, what lost love or deceased kinsman is worth death? The space in my life that my half-brother once filled is now an aching icy pain, like the hole left after a tooth is pulled, and I am dying in weeks or months—and yet I still fight for life, as every mouse does, until the final beak-blow. The grace in tragedy is not to succumb, but to fight on. Fudoki is rich throughout with realizations like these. —it is easy to ignore a cat when she is not of a mind to remind you of her existence, though otherwise it is impossible. My woman Shigeko came to me as suddenly as a sneeze. I find that insights grow more frequent as I have less time to take advantage of them. Although Kij Johnson herself is from the far-off prefecture of Iowa, and as of this writing lives in an even more exotic locale called Kansas, Fudoki itself always felt intensely real to me—deeply researched and consistently voiced, as authentic and respectful as a gaijin's account could be. If a comet is without meaning, it seems possible that a woman is likewise so; and I do not wish to think this of myself. Princess Harueme needn't have worried, and neither should Johnson—comets do not have such wishes, something which of itself ascribes meaning. After I had enjoyed Kij Johnson's recent The Dream-Quest of Vellitt Boe so much, I was already primed to reach out for more of her work—so Peter T.'s endorsement came to me at a very auspicious time. Fudoki was an amazing find, worth every second of the time I spent finding and reading it. First, I have to say, that jacket description is riddled with so many small inaccuracies about this story that I was tempted not to include it. They aren't fundamentally important inaccuracies -- though it is very important to realize that the "she" referred to at the start of the second paragraph is Kagaya-hime, not the "aging empress" who isn't an empress at all -- but it bugs me now that I've read the story to see how wrong it is. Ah well, moving on. This is a wonderful book, sure to appeal to First, I have to say, that jacket description is riddled with so many small inaccuracies about this story that I was tempted not to include it. They aren't fundamentally important inaccuracies -- though it is very important to realize that the "she" referred to at the start of the second paragraph is Kagaya-hime, not the "aging empress" who isn't an empress at all -- but it bugs me now that I've read the story to see how wrong it is. Ah well, moving on. This is a wonderful book, sure to appeal to fans of Patricia McKillip and Catherynne Valente, though it's more accessible than either of their work. It's very much rooted in the myths of Japan, and while I don't know a ton about the time period, nothing of what I do know was contradicted by what Johnson wrote, so I am assuming that she captured the era (Heian-era Japan I believe) with some degree of accuracy. Like in McKillip and Valente's work, this is not fantasy that lovingly details a set of rules for its magic system; it is fantasy where there are gods and there are humans and there are animals and the lines between these things are not sharp at all, where anything can happen and no one is much surprised when anything does. Logic plays a role, but it's dream logic, and the worst error to commit is in assuming that any other being's motivations match our own. But what made this book brilliant (and caused it to be nominated for the James Tiptree, Jr. Award) is the way in which it is fundamentally a womens' fantasy. The fudoki of the cats is entirely female; there is no place for males, and none of the fudoki cares to even know the names of the toms that fathered their kittens. Harueme (this would be the aging noblewoman narrating Kagaya-hime's tale, half-sister to the former Emperor Shirakawa) also lives in an almost entirely female world, where women have husbands and lovers but their days are spent hidden from male sight (and even the seductions take place with an eye to maintaining the illusion that no man can see their faces). Harueme loved her half-brother, and reminisces about her soldier-lover Domei, but the most important relationship she has is with her attendant, Shigeko. The novel even acknowledges that women menstruate -- I'm pretty sure I can count on one hand the SF/F novels that do that -- and there are elaborate (historically-based, I assume) codes of conduct built around that simple fact of life. It's a novel about women's issues: family and home and place in a society when all of those things are rigidly proscribed. Fudoki is an entrancing fantasy set in medieval Japan. Johnson skillfully interweaves the reminiscences of an aging princess with the tale the princess is writing of a woman turned into a cat, who may or may not exist outside the princess's imagination. The language is exquisitely precise, with never a wasted word, and the portrayal of medieval Japan brilliantly vivid. There are two stories in this book - that of the elderly Princess Harueme, and that of Kagaya-hime, a cat who takes on a woman's shape for reasons that she does not understand. In the beginning the tales are separate - Harueme writes Kagaya-hime's tale to occupy her as she prepares to leave the Emeperor's palace and go into a convent to die - but somewhere along the way they begin to weave together. The blurring of boundaries between the two women's tales is masterfully done, and not every segue is apparent until you're deeply inside the thoughts and feelings of the opposite woman to the one with whom you began. "We" and "I" become loaded terms that pull you, as the reader, into the text as well - the book itself loses its boundaries, and the tale becomes a living thing that encompasses all female experience. That said, the subject matter is not dainty, or sheltered, or female by the measure of any particular trope. Princess Harueme loves beetles and mice, loved to draw the wings of birds as a child, has read as much about war as she can lay her hands on. Kagaya-hime travels long distances, defends herself when attacked, hunts and comforts and fights, on her own and with others. Between the two tales we see the measure of a woman as defined by convention, and the measure of a woman defined by herself. Ancient Japan fascinates me and I can't think of a more interesting time that Heian-kyo, 11th century in Japan's old capital now known as Kyoto. While this story takes place in late Heian - 1129, I believe the author mentioned - it has all the charm and cultural nuances one would expect. Sei Shonagan finds her name in these pages, as does Murasaki Shikibu. We read about ancient Japanese marriage customs and war and seiges. We learn about the life of the gods that govern and of times of hardship. Ancient Japan fascinates me and I can't think of a more interesting time that Heian-kyo, 11th century in Japan's old capital now known as Kyoto. While this story takes place in late Heian - 1129, I believe the author mentioned - it has all the charm and cultural nuances one would expect. Sei Shonagan finds her name in these pages, as does Murasaki Shikibu. We read about ancient Japanese marriage customs and war and seiges. We learn about the life of the gods that govern and of times of hardship. We follow the life of a cat who suddenly finds herself in woman-form on a quest though she does not yet know it because she is just 'nothing and no one'. This is also a tale of an old Heian princess as she slowly fades away from this world to the next, some unnamed tumor growing inside her killing her a bit day after day. A captivating tale, written in the form of an old woman telling a story. Reading it reminds me of fairy tales read to me as a child. The language is beautiful and, well, it tells the story of a cat, so if you love cats, you will love this book! I won’t say DNF. I do want to finish it one day. The prose in this thing is absolutely gorgeous, full of lines that shine like diamonds. Alas, the narrative flows like wet cement. Maybe later. I was a little disappointed after reading this book because I had first read The Fox Woman by Kij Johnson and the voice of the narrative was so different. What I had liked most about The Fox Woman was the way it was written: very wistful and almost romantic while still remaining mystical and supernatural. I also loved the poems written by each of the characters. None of that was in this sequel. When I first started to read, the tragedy that occurred to the tortoiseshell cat drew me in and I want I was a little disappointed after reading this book because I had first read The Fox Woman by Kij Johnson and the voice of the narrative was so different. What I had liked most about The Fox Woman was the way it was written: very wistful and almost romantic while still remaining mystical and supernatural. I also loved the poems written by each of the characters. None of that was in this sequel. When I first started to read, the tragedy that occurred to the tortoiseshell cat drew me in and I wanted to know more and wanted to see what would happen to the cat. However, once she transformed into a woman, I lost my desire to continue reading for a good part of the book(I did continue, though). What had made me sigh in disappointment was the fact that once she had been turned into a human, in what was (sort of) meant to be a punishment or road to understanding, everything that she needed just magically appeared. A farmer's wife asked if she carried needles, and suddenly she did. Often things would appear out of no where even if she didn't even realize that she had needed them because she had never been near humans and didn't know about these things. Knives, a sword, a bow and arrows, needles, a horse, servants...she did not ask for them and didn't know she needed them, and yet they were magically provided. Now, at the very end of the story I realized the reason why these things magically appeared, but it was still distracting every time it happened until the point in the story where the reason is hinted at (at least for me). As a reader, I felt that too many things were being provided to her so freely, especially if the one who turned her into this form was seemingly upset with her. I expected a little more hardship, I suppose. Otherwise, the tortoiseshell's story was very engrossing and I read it mainly for the cat. However, mixed in with the story of the cat is the story of the court woman writing the cat's story. In the beginning of the book, I didn't really want to read about the court woman. Slowly over the course of the book, I began to want to know more and more about her. In the end, I ended up wanting to skip the parts with the cat to see what would happen to the court woman. I ended up being fascinated by the rules a court woman from that time period in Japan had to live by. I can't seem objective about this book and I won't even try. Fudoki is a great dang book about cats and the people who love them. The novel follows two stories. First is the story of an elderly Japanese princess with lung cancer, in feudal times, as she comes to terms with her death and muses on her life. She reflects back on the servants she has lived with, the people she has loved and the way her life had lead down. It's quiet and reflective, in the way that any good book about someone who is d I can't seem objective about this book and I won't even try. Fudoki is a great dang book about cats and the people who love them. The novel follows two stories. First is the story of an elderly Japanese princess with lung cancer, in feudal times, as she comes to terms with her death and muses on her life. She reflects back on the servants she has lived with, the people she has loved and the way her life had lead down. It's quiet and reflective, in the way that any good book about someone who is dying should be. There's nothing amazing or special to be said here, it isn't a literary masterpiece, it's just a story of an old lady winding down for the big nap as she writes her memoirs. Then there's the second story. The one I can't be objective about. The princess's diaries, it turns out, are the stories she writes of a cat who lost her family. Distraught, she becomes a woman and a warrior, because as a cat she is nothing. It's the most dang cat thing I've read, all the way through. Reading with my cats alternating between wrestling over my legs and purring on my chest only added to the cattery. Such cat. I loved that this book was very female. One story is about how a woman can be defined through culture; the other a woman defined through nothing but her own actions. In the world of cats, male cats have no real cultural purpose. In the world of humans, we never interact with a single man. It disappointed me a bit that the character of Domei is just talked about, and in some chapters to extreme lengths, rather than given any stage time. It's only a disappointment because in reference, Domei sounds so interesting but oh well. It took me a full 120 pages to finally get truly interested in this book. It's jut so very slow. Now, it's meant to be. It's about a dying old woman who, while writing a fictional story, is contemplated her life. From the very beginning there was a lot to think about, but I was honestly bored. However, once Hime becomes human things pick up a little...or maybe I had finally just adjusted to the slow pace. But once I got past the slow pace, I was really impressed with this as a contemplation on p It took me a full 120 pages to finally get truly interested in this book. It's jut so very slow. Now, it's meant to be. It's about a dying old woman who, while writing a fictional story, is contemplated her life. From the very beginning there was a lot to think about, but I was honestly bored. However, once Hime becomes human things pick up a little...or maybe I had finally just adjusted to the slow pace. But once I got past the slow pace, I was really impressed with this as a contemplation on place—the idea of one's social place, place as a physical location and the intersection of these ideas that construct our sense of ourselves (Fudoki). Harueme is a princess—daughter, grandaughter, sister and aunt to emperors. But this same high rank (place in society) is a prison of sort, keeping her in her place dreaming of being free, of seeing the world and new places. She is never allowed to escape her place, physical or cultural. While simultaneously, Hime is a cat who has lost her Fudoki, her place and therefore the sense and understand of self that it provided. She spends the whole book looking for a place to be her and her own. Fudoki is an amazing book but won't be for everyone. It is slow, sort of meditative in style, following the preparation for death of an aged princess. She is cleaning out her belongings, including many notebooks of writing, but she finds she needs to fill some blank ones with one last story. That tale of a cat who loses her home and travels far, turning into a cat-woman and warrior as she journeys, mingles with Princess Harueme's memories of her sequestered life and of her lost dreams. Their stori Fudoki is an amazing book but won't be for everyone. It is slow, sort of meditative in style, following the preparation for death of an aged princess. She is cleaning out her belongings, including many notebooks of writing, but she finds she needs to fill some blank ones with one last story. Their stories become more complex, intense, and fulfilling as Fudoki moves toward its conclusion. I love beautiful writing and this book is filled with it. "She was learning something about grief, that it begins with a great blow, but heals with a thousand tiny strokes." "There was a day, beautiful and surprisingly cold: autumn, though winter was a clear omen in the air. The forest shivered gold and red and pine-green in the wind. There were ducks overhead, shouting directions at one another as they arrowed south in great untidy flocks." This was a lovely little tale. I can tell that it's not a favourite, because I didn't devour it or feel any need to be completely immersed in the novels, but it was lovely. The way that Johnson flicked between the tale of Kagaya-hime, Harueme's present life, and Harueme's past, was wonderfully done and it never confused me. There's nothing more irritating than an author writing a story in this convoluted way, but not having the skill to do it well. The relationship between Harueme and Shigeko was This was a lovely little tale. I can tell that it's not a favourite, because I didn't devour it or feel any need to be completely immersed in the novels, but it was lovely. The relationship between Harueme and Shigeko was beautifully written and Johnson perfectly depicted the strong bond of female friendship and love. Oh, and the writing was goddamn perfect. One of the few times I've been equally enthralled by two entwined narratives, instead of skipping through to read about my favorite character. In historical Japan, a cat loses the story of her bloodline, and must deal with her grief when she is turned human; an empress is dying, and begins writing her own tale. I've also found Johnson to be one of the few convincing Western writers of an Asian perspective. Sorrow for mortality and the desire to alter things from what they are. These are the overwhelming tones of the book. Great characterization and unique portrayal of anthropomorphized animal character. If you were to pick a book for every season, my brother said last night, spring would have to be Secret Garden. For winter... maybe The Dark is Rising. We got no further than that. I might choose the LotR trilogy for autumn, because of that bittersweet sense of loss and fulfillment that I always feel at its conclusion, but then I choose LotR for a lot of things. Fudoki is not a seasonal book, save perhaps in the sense that our lives themselves have seasons. In that case, it might feel like autumn If you were to pick a book for every season, my brother said last night, spring would have to be Secret Garden. For winter... maybe The Dark is Rising. Fudoki is not a seasonal book, save perhaps in the sense that our lives themselves have seasons. In that case, it might feel like autumn and also like spring. I would call it a journeying book; I've seldom felt such a sense of passage and change and destination, in reading any story. There is the journey of the storyteller, a static meandering backwards and forwards in her own life as she writes the story of a cat's journey in a series of notebooks. And that story is both a literal journey in space and geography, and more metaphysical, in spirit and philosophy and maturation. I read once that if you follow any story too far, it always ends in death. Fudoku does not avoid that. BUT - uniquely, there is no sorrow here; only the anticipation of a new adventure, a different life, a continuing journey. In "Grimbold's Other World," a childless queen, aging but beautiful, weeps over the lines on her face, mourns that the knights she sends out to seek her perfect flower no longer return with the flowers of spring, no longer journey for very long. A boy asks her why she would weep for spring when summer has come, and she challenges him to carry his metaphor further, into autumn and then winter. What flower, what hope would he offer her in winter? Perhaps, he says, the promise of another spring. That is the journey that Fudoki takes; a long journey through winter, and a promise of renewal after that. It's very beautiful. I read it in two sittings because it carried me irresistibly forward. To speak merely of craft, the juxtaposition of the story-teller's life against the cat's life is deftly handled, and - unusually, I find - I was equally interested in each. I love both these women. I love the thought of their lives continuing after this story ends, for however long, and I feel that I can sense the shape that they take. Kij Johnson is a master of quiet, unassuming prose. Unlike some fantasy I have read Johnson’s pacing is measured, it does not throw the reader between dramatic battle scenes and trite monologues about good and evil, instead she dwells on bright details and allows for her characters to grow. War, magic, and battle are elements in Johnson’s story but they remain parts of the narrative never drowning out the whole. Fantasy seems to be the genre with the most potential, the author’s imagination is t Kij Johnson is a master of quiet, unassuming prose. Unlike some fantasy I have read Johnson’s pacing is measured, it does not throw the reader between dramatic battle scenes and trite monologues about good and evil, instead she dwells on bright details and allows for her characters to grow. War, magic, and battle are elements in Johnson’s story but they remain parts of the narrative never drowning out the whole. Fantasy seems to be the genre with the most potential, the author’s imagination is the limit, but it often ends up as repetitive tropes. Fudoki feels free of those limitations and is a pleasure to read. One of my favorite elements of the novel is the rich foil between Kagaya-hime and Harueme. Harueme, the emperor’s sister, is constrained by her place in society, seeking freedom while Kagaya-hime the cat warrior has lost her niche in the world and searches for a new sense of identity. One character who wishes for structure and one who looks for it. The interplay is excellent and Johnson manages to subtly weave the foil into her book. Kagaya-hime and Harueme are great characters. Harueme is especially well done, it is rare enough that an elderly and dying character is among the main cast of characters but also experiences personal growth. Nearing the end of the story, I grew attached to Harueme and as the ending grew nearer I began to feel a creeping sense of despair about her pending demise. Harueme’s humanity is splendid, whereas Kagaya-hime’s feline attributes are well depicted. Kij Johnson has done extensive research on feline behavior, per the research notes, and it shows in her characterization of Kagaya-hime. The secondary characters are strong as well. My hesitation in giving Fudoki five stars was mostly due to the resolution. (view spoiler)[ It is revealed that Kagaya-hime is real and that Harueme has escaped the confines of the palace in order to meet the cat. The ending felt contrived, after Harueme’s beautiful reminiscing and further development in the “fictional” story of Kagaya-hime it felt like the author sacrificed the arc of the story for a happy send off. (hide spoiler)] Also, I felt that parts of Harueme’s memories dragged, it may be my penchant for story motion but there were points where the memories felt extraneous. Resolution and slow points aside, Kij Johnson’s story is great. I enjoyed this book more than The Fox Woman. It had better characters and a better story. Both Kagaya-hime and Harume are interesting and likable, but you never get overly familiar with them since they are both people who tend to stand apart from others either due to social status or the fact that cats are just very aloof. Although the story had an overall melancholy tone, it had a hopeful ending. My only complaint is the way that the author uses Japanese words. She will write the phrase "kaze-c I enjoyed this book more than The Fox Woman. It had better characters and a better story. I enjoyed this book: it was very unusual and had a mystical feel to it. At first, I didn't like that there were 2 stories at once, the Princess Harueme's story of her growing old and remembering her past, and the story she was telling about the cat-woman Kagaya-Hime. But as the story progressed, I found that it couldn't have been told any other way. The story of Harueme is tied to Kagaya-Hime, and we learn more about both characters through their counterparts. And as for Kagaya-Hime, she was not I enjoyed this book: it was very unusual and had a mystical feel to it. At first, I didn't like that there were 2 stories at once, the Princess Harueme's story of her growing old and remembering her past, and the story she was telling about the cat-woman Kagaya-Hime. But as the story progressed, I found that it couldn't have been told any other way. The story of Harueme is tied to Kagaya-Hime, and we learn more about both characters through their counterparts. I probably wouldn't have finished this book if I hadn't been on vacation. The story is 2 in one - first an aged and dying minor royal lady, the second a figment of her imagination - a cat turned into a woman warrior. The relationship between the 2 women in the joined story was obscure (at best). The whole book is a ramble, there is no beginning nor much of an end - a lot of middle though. It was only mildly interesting. The historical period was too hard to parse as presented. Kij Johnson is an American writer of fantasy. She has worked extensively in publishing: managing editor for Tor Books and Wizards of the Coast/TSR, collections editor for Dark Horse Comics, project manager working on the Microsoft Reader, and managing editor of Real Networks. She is Associate Director for the Center for the Study of Science Fiction at the University of Kansas, and serves as a fina Kij Johnson is an American writer of fantasy. She has worked extensively in publishing: managing editor for Tor Books and Wizards of the Coast/TSR, collections editor for Dark Horse Comics, project manager working on the Microsoft Reader, and managing editor of Real Networks. She is Associate Director for the Center for the Study of Science Fiction at the University of Kansas, and serves as a final judge for the Theodore Sturgeon Memorial Award.